Camperized vehicles are becoming a hot topic in the media with the boost of interest in nomadic lifestyles and a life on the road. There’s nothing more gratifying than being able to work wherever you want, whenever you want and rest easy each night in a new, secluded paradise all to yourself with the starry night sky as your big screen. Whether you’re looking to camperize your vehicle to lower a budget for a road trip or you’ve saved up, quit your job and are ready to travel, having your own little home on wheels enables freedom, convenience and adventure opportunities. First thing’s first, you need a vehicle that can be easily camperized; attempting to camperize your 1991 Suzuki Swift isn’t going to go as easily as you hope. Ideally, vans, SUVs and trucks are going to be your best match especially if you don’t wan’t to sleep in a cramped space, hugging your knees to your chest every night, although that does not mean it is impossible to camperize something smaller. When choosing a vehicle worthy of being camperized, check that the rear seats are either removable or fold completely flat into the floor. If they are removable, how hard or easy is the process? Being “easily removable” does not include renting an angle grinder or saw from your local hardwear shop to get the job done. Once the seats are removed or folded down, lie inside and check that the length will be good enough. It’s most likely that you’ll want to sleep with the doors on your vehicle shut, so shut the rear door and confirm that you’re still comfortable. (Look out for dangling toes before slamming the door shut if you’re tall). If the size is right, perfect! Next step is to get your measurements. Some people may find the easiest route is to simply put a mattress straight into the vehicle and voila! Finito! This may work for those who do not have much gear to bring along and will be only sleeping in the vehicle, although for others, it may not be the most practical route. 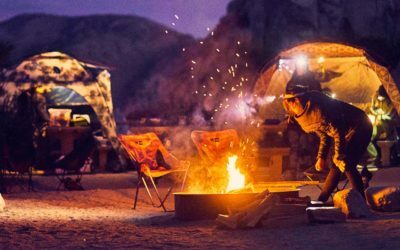 If you are properly camping, you’re going to have all your cookware, your clothing, your food and if you’re doing sports along the way, you’ll have sporting equipment as well. For this, it’s not as simple as throwing in a mattress. You’re going to want to measure the length and width of the area where you hope to put the bed. With these measurements, you’ll be able to purchase some plywood or something similar that is strong enough to sleep on and use it as the base. While taking measurements, keep in mind the driver’s and passenger’s seat position and how the chair reclines if it does at all. If the bed is built too big, the driver won’t be able to adjust the driver’s seat and it may be uncomfortable and unsafe for driving. For the ultimate camperized set-up, you’ll want to build a bed platform which is raised up from the floor of the vehicle. This can easily be made of wood and even scraps you find from your last home reno or at the hardwear store. Once you’ve taken accurate measurements, you can begin your hunt for wood. The idea behind having a raised bed allows you to use the underneath part for storage. It would be a good idea to get some measurements of bins or boxes that you will be using and storing underneath and even the measurements of your cooler so that you can ensure they will fit easily. If you’re good with a saw, hammer and nails, you may want to get a little more creative and can easily find designs online for handy drawer designs. For those who are not so carpentry-skilled, rubber bins from your local shop are perfect. If you can find something with wheels, it will be easier to slide in and out although everyone will have their preference. *A helpful hint: choosing bins that are transparent rather then coloured makes finding what you’re looking for much easier. Once you have the foundation of your bed measured out, you’re going to want to decide and pick a mattress. 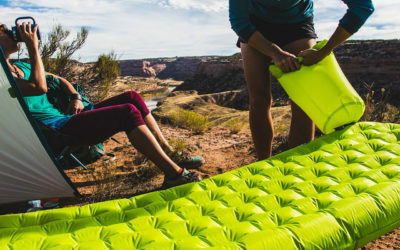 If you have the space, you can pick a regular household mattress, you can take a malleable foam matress or for simplicity and to keep costs really low if you’re only going to be doing a few short trips here and there, a thick camping mattress like the NEMO Equipment Vector 25 or the Therm-a-Rest NeoAir Camper will do the trick. For the ultimate glamping experience from your camperized vehicle if you plan to spend an extended amount time sleeping in it or you are a sucker for comfrot, you may want to opt for something thicker and more suited to car camping such as the Therm-a-Rest DreamTime or even just your basic inflatable air mattress. Depending on how much room you have to work with, you can really personalize your set-up. If you’re working with a regular sized van like a Ford Astro Van or a Dodge Caravan, a simple raised bed frame with storage underneath may be just right. You can add roof racks to the top for added storage for bikes, surfboards, kayaks and even a storage bin on top for the smelly items you don’t want inside or small delicate items such as fishing rods. If you’ve got a truck, first step is to get a canopy so you have a roof over your head. Some canopies are taller than others so depending on your height and how much time you plan to spend in the back, you may want to opt for something a little bit taller. Once you’ve got your roof, you’ve got a vacant space inside to work with and let your dream camperized plan unfold. Keep in mind that some trucks have a long bed and will give you more space than others, so if you want to have a bed as well as some additional space to work with, this will be an ideal option. If you just want room for a cozy bed set-up, you may be bale to make a short cab work. For those working with something a little larger like a sprinter van, a Ford Econoline or even an old school bus you can let your imagination run wild and free and design the perfect home on wheels. Some designs feature a bed at the back so you can open the doors and enjoy a great view at sunrise or count the stars. In the middle section behind the front seats, you can construct some counter tops, shelves, even have drawers that pull out from under the bed. If you’ve got the resources, time and skills, you can design just about anything. Personal touches can make something dull become spectacular. They can add sentimental value, create a special connection with someone or something or simply just amp-up the awesome factor on something that is alreayd totally cool. For your camperized vehicle, little homey touches that add comfort and convenience are a great addition. SOmething liek curtains esecially are very handy on the road. Because sometimes you want to sleep in a little later than sunrise and privacy is a necessity, curtains or some type of coverage for your windows is necessary. For a simple curtain setup, you can string a rope or cable along the tops of your windows (tucking it into the plastic frames were available) to support a set of curtains. If you’re working with a large van or bus, you may even be able to use a drill, buy some hooks and construct your own, sturdy curtain system. If you’re striving for a camperized set-up that will double as your new home on wheels, taking the extra bit of time to install things properly and use sturdy supplies and materials will only be re beneficial in the long run. If you’re planning to be on the road in the colder months, a little stove with a chimney could be a great addition. If you choose to add a stove and chimney, it is essential that you have someone who is knowledgeable and experienced install it so you don’t end up with any problems along the way. The options are limitless! You can have a bunkbed, surf board racks on the ceiling, shelves and tables, even chairs! Camperize.com is a great resource for finding information for everything you need to know about how to camperize your vehicle from mounting solar panels, to installing outdoor showers. There are also plenty of other great resources which can be found online. If you have an idea in your head of a set-up that you want, browsing other set-ups can only spark more ideas and result in something really great. If you’ve often dreamed of owning a VW Westfalia or Vanagaon but could never find the perfect one within your budget, designing and constructing your own camperized vehicle can be more rewarding and enlightening as you can have everything exactly how you like. From the fine details of the layout, to the accessories and decorations you put inside, you can cater it to your every wish. Life on the road isn’t always glamorous but if your only decision each day is where to stop next and you have your loyal companion next to you, what else is there to worry about? There is 3 thoughts on this article titled “How to Camperize Your Vehicle”. Hello Kelsey, thank you for your quick reply and the tips. We will take a closer look into it! Hello Marta, glad to hear that our article has been able to help you and your husband with your new project! Unfortunately we do not specialize in camper products but I would recommend checking out a hardware store nearest you for this type of shelf. With the influx of van camping these days, you may even find what you are looking for at an RV dealer, a van dealer or even a construction type shop. They may have these types of shelves on sale as they would be commonly found inside work vans and trucks, etc. I hope this will at least a little bit helpful. Happy adventuring!